Montabert, a worldwide leader in the design and manufacture of hydraulic demolition and drilling attachments, recently opened a state-of-the-art remanufacturing facility in Lake City, Ga., to address the growing demand for remanufactured hydraulic breakers and hydraulic drifters. Factory certified Montabert technicians disassemble the used hydraulic breaker, carefully inspecting all of its components. The unit’s wear parts — seals, bushings, tool retainers, diaphragm and shank stop — are replaced, while the unit’s remaining parts are cleaned or replaced according to factory specifications. The unit’s cradle is generally reconstructed, as well. The breaker is then reassembled and painted before undergoing testing. 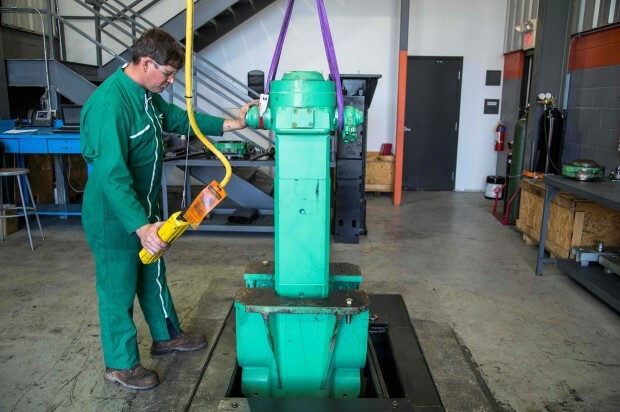 The remanufactured Montabert hydraulic breakers are sold to customers with one tool (moil, chisel or blunt) and covered by a six-month factory warranty, including parts and labor. In addition, Montabert offers optional automatic grease stations, mounting caps and hoses. Similarly, factory certified technicians disassemble the used hydraulic drifter, carefully inspecting all of its components. The unit’s rubber seals and diaphragm are replaced, while the unit’s remaining wear parts — front head bushing, shank top, spline nut and bushings — are cleaned or replaced according to factory specifications. The drifter is then reassembled and painted before undergoing testing. The remanufactured Montabert hydraulic drifters are covered by a three-month factory warranty, including parts and labor. A list of remanufactured Montabert hydraulic breakers and drifters available for sale can be found at tramacbymontabert.com/reconditioned.